Popcorn Cinema is a popular movie theater chain based in Chicago, Illinois. The owners have recently announced the opening of the fifth Popcorn Cinema location, which will be located in Madison, Wisconsin. Due to its expansion, Popcorn Cinema has the need for a Computer Applications Specialist to assist in creating documents important to the success of the business. In this exciting simulation, students will learn what happens “behind the curtain” while working for a movie theater franchise. From creating a news release and movie e-review, to designing a gift card and analyzing ticket sales, students will be fully engaged as they complete real-world tasks that assist in the operations of Popcorn Cinema. The Online Instructor and Student Resources for Popcorn Cinema are required and include Project Answer Keys and Logos. 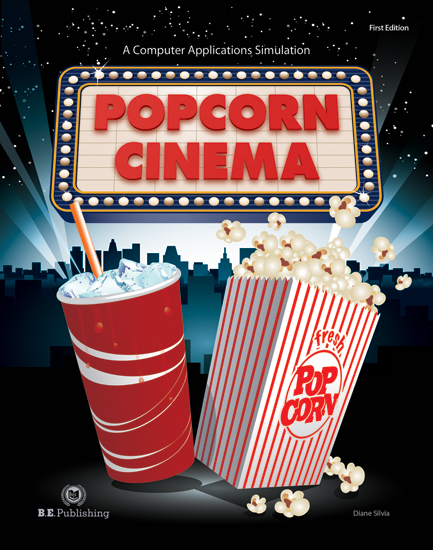 Three versions of the Popcorn Cinema logo are provided in .PNG format. These logos are intended to help student work appear professional and polished. Resources for this textbook are housed on our interactive digital eLearning platform, eCTE. Many projects require students to insert the Popcorn Cinema logo to create professionally-styled documents. eTexts are housed in our interactive digital eLearning platform, eCTE. B.E. Publishing's Digital Platform, eCTE, provides easy and interactive access to digital content for Career & Technical Education.